At the very end of the 19th century, Grigoriy Grigorievich Eliseyev, the scion of an immensely wealthy family of merchants who dominated the market for fine wines in Russia, decided to build a new shop on Nevsky Prospekt as the flagship of his family business, which already had five stores in the most prestigious neighborhoods of St. Petersburg. 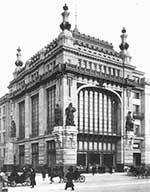 In 1898, he bought the plot of land at the corner of Nevsky Prospekt and Malaya Sadovaya Ulitsa and commissioned architect Gavriil Baranovskiy to create a building fitting to the illustrious reputation of his company. 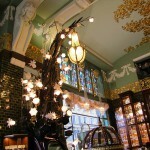 Completed in 1903, it shared many characteristic with the Singer Company Building that had opened the year before. It also had a metal frame, allowing most of the facades to be taken up with windows, and was also decorated with weathered bronze statuary by Estonian sculpture Amandus Heinrich Adamson. Both buildings were strongly criticized in many quarters for their vulgarity and the lack of deference to their historical surroundings. 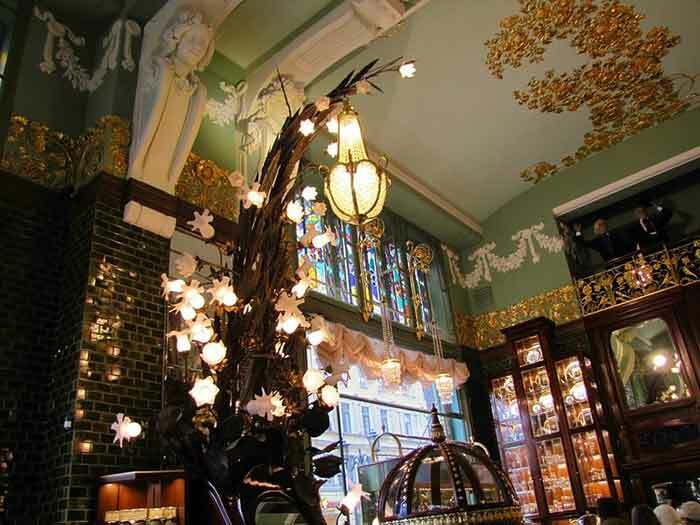 The ground floor of the building was divided into three retail halls, all featuring sumptuous glass and bronze decoration, while the first floor housed a restaurant and a theatre. 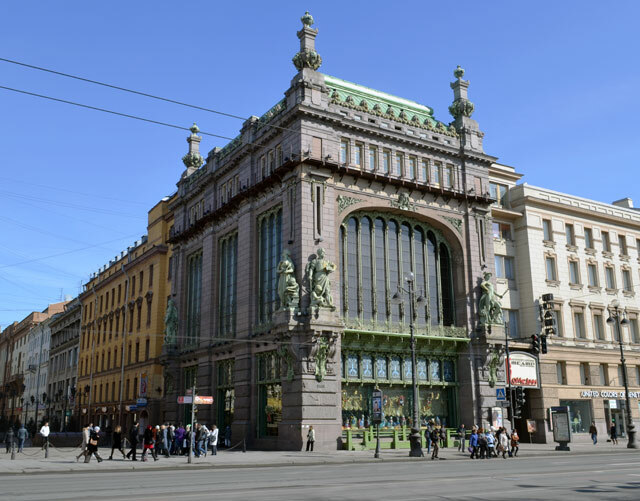 While critics may have been ambivalent about the building, Petersburgers soon grew to love it, and continued to call it the Eliseyev Emporium long after the Bolshevik government had nationalized it and renamed it Gastronom No. 1. The theatre was opened as the Theatre of Satire in 1929. Working there from 1935, the director Niklolay Akimov turned the theatre into one of the most popular and respected in the city. Particularly famous were his productions of fairytales by Evegeniy Shvarts. 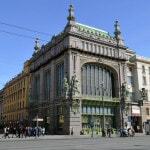 The theatre is now the N. P. Akimov Comedy Theatre.